My last visit here (btw, we loved it) we were twice treated to a window view of an American Bald eagle. The waitress says he lives nearby and she never tires of seeing him. I'd love to go but I have to keep an eye on Gyp to make sure he doesn't eat something nasty. It's a difficult trip but somebody needs to do it. Dinner starts at 5 with the bar opening at 4:30, which would be our time preference. Doubtful for us based on work availability. Mrs.Roadhouse is taking a pass on this one. ChiBears15 will be my date for the evening. I'd like to make the reservation by 9pm tomorrow night, if any and all interested parties could please speak up by then it would be appreciated. Thanks! A couple of guys from the bike shop went to Tommy & Di's Rustic Inn in beautiful Oconomowoc for their Friday Fishfry yesterday. Their fish prices are very reasonable, but their meats and burgers got my attention. 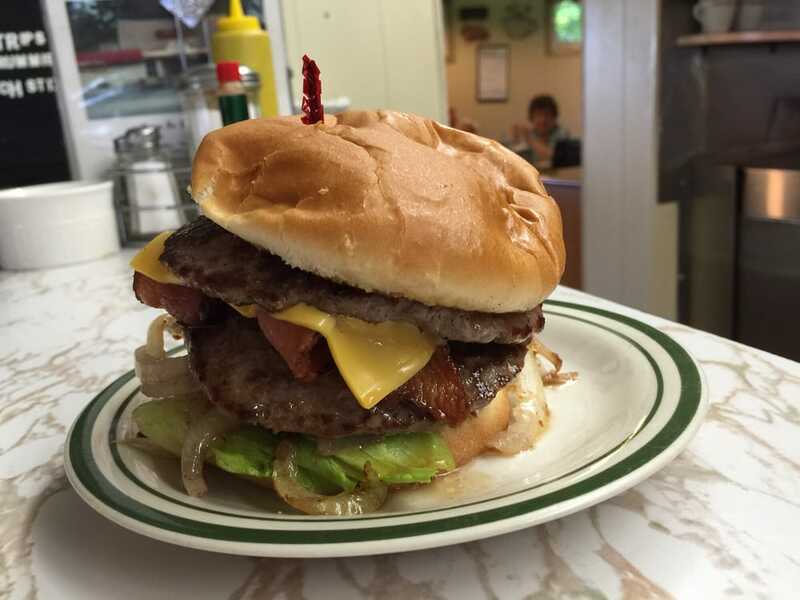 Starting on the informal side, Our Famous Hamburger is only $9 for a 1 pound patty. A Triple Famous Burger is just $20 for interested Diners from ChiTown. For any Shy Bears joining us, the Baby Burger is $7.50 (1/2 pound patty). A four piece Broasted Chicken meal Screams for attention at only $10. The dinner choices really caught my eye. Tenderloin for Four or More is $61, which includes a 3.5 pound whole beef tenderloin. But the best deal for you bargain hunters may be Tommy's 40 oz. Prime Rib for just $41. We'll make a few scouting runs and report back on the quality of the food. Wow! Great looking menu and prices!! Add 2 more to the reservation. We will be able to join the subcommittee at Hob Nob on 2/23. The reservation has been made under my name: party of 8, this coming Saturday at 5:15pm (bar opens at 4:30). And since it's only Monday we have a good 3 days to make any additions (hint hint). It was (hic) great to (hic) see you (hic) too! Research has concluded that Hobnob's prime rib is good for both Saturday dinner and Sunday breakfast. I hope everybody had an easier drive home than we did. 2 hours to go 80 miles overland on the 2-lanes after dark through fog and torrential downpours isn't the greatest driving experience. An hour on I-94 was bad enough. Glad you eventually made it home OK Brad. Thanks for setting up this event, we had a really great time. Although next time we should all wear our Rat-Pack duds to really appreciate the ambiance. We were either luckier than you, or I'm just a more reckless driver than you all. We were home in less than an hour, admittedly battling lesser amounts of fog and rain. I like the Rat-Pack dress-up idea. Since I'm the only Jewish guy in the group, I get to be Sammy Davis Jr. The food was great. Prime Rib was very good, although the entree stars for me were the unwritten specials, Chicken Oscar and Lamb Shank. Of course the one thing that had everyone's eyes rolling into the backs of their heads was the Brandy Alexander ice cream drink for dessert. As good as the meal was, we also struck pre-dinner gold with a quick stop for Tacos at La Tapatia Super Mercado about six minutes up the road from HobNob. We discovered them while traveling to Wells Brothers Pizza last year and vowed to check them out. Fortunately ChiBears15 remembered that promise and suggested the stop. Tacos were excellent, and the Tamales to go were exceptional, even warmed up the next day. As always, all the food was second the great company of our fellow Contingencies. Nice to talk like grown-ups in a grown up environment. Hope to see as many of you as possible at X1's Mardi Gras party on Tuesday, March 5th! Uh, no. You're clearly Joey Bishop. Was I the only person to order the French onion soup? I thought it was very good, especially since the onions were cut more into long strands/shreds instead of pieces and were very tender. You were the only French Onion Soup order last night. I agree that this is a very good version, I had it last time we dined at Hobnob. we'll have to go back when we can enjoy the view. The lamb shank was phenomenal, as was the filet oscar. The additional asparagus we ordered were so tender and sweet. just divine- tender, buttery, garlicky and rich. A real treat! Sammy Davis jr. is all well and good, but who gets to dress as Britt Eckland? Forgive me for intruding, as I have not attended any of your events, but I grew up in Wisconsin and had many wonderful Supper Club, cafe and diner experiences before i moved away, and I so enjoy reading about your adventures in eating. We still travel to Wisconsin 4-6 times a year, and when I can get my husband to actually stop and eat, I like to have some suggestions at the ready. Does anyone have any experience with Elias Inn in Watertown? Thanks, and keep it up. Elias Inn was the very first thread-related place we visited, so head back to page 1! We'd love to read about the places you've been, especially if you have some stories for the supper club thread. Where in WI are you from? As the ChickenMan says, Elias Inn was one of our first stops in this ongoing Supper Club saga. They served a very good Fish Fry, but the thing that really got our attention was their regular menu featuring numerous German specialties. The Contingent has been threatening to revisit Elias Inn on a non-Fish Fry night so we can explore those menu options, but we always seem to get sidetracked by the many other worthy places we haven't gotten to yet. Another worthwhile Supper Club in Watertown, Donny's Girl, is a favorite of JRPfeff and Pie Diva. Also worth visiting, Zweig's Grill for amazing Smashdown Burgers. In fact, Watertown/Jefferson County was the site of a memorable Contingent tour back in 2013. Hope that helps you in your travels. We revisited Donny's Girl last night. The Sunday Specials never disappoint. Wow, I don't know how I missed page one. (insert blushing emoji) I grew up in Polk County, then lived in neighboring St. Croix County for a number of years. Amery, New Richmond, that area around I-94. Favorite supper clubs back in the 70's and 80's were Paradise and Indianhead, both in the Balsam Lake area, the Laurel east of New Richmond, and Lindy's south of NR, which sadly burned down. So many restaurants burn down. The others are still operating, though with more "modern" menus, e.g., spinach artichoke dip. LOL. Still mostly steaks, ribs and seafood, in nice settings. We have a cabin northeast of Cable, and enjoy Pla-More and Garmisch USA when we want to drive a little further than the corner bar. Garmisch does an excellent Friday fish fry, but offers fewer German dishes that night. The building and location are worth the trip. Of course getting around Lake Namekagon from any direction is a slow drive, dodging deer. Good times. We also dined at the original Famous Dave's outside Hayward (a family friend was crazy about the place) many times before it sadly succumbed to the flames. However, the Old Southern BBQ in town that Dave Anderson has opened is actually much better than the original, IMHO - we do takeout only, and reheat the meat on top of the woodstove. Every summer we spend a week on Lake Owen so I know the area well, and when she was growing up my wife and her family would stay at Lakewoods for a couple of weeks every year. We've never been to Garmisch for the fish nor Pla-Mor at all, although we do drive past on our way to Anderson Island for pizza. Maybe this year we'll check out Garmisch's fish fry. Last year we went to The Ranch in Hayward for the first time and this year I'm looking at Dreamland Supper Club in South Range for a dinner.